Do you often find yourself popping sleeping pills, to get hold of that elusive thing: sleep. Then this article is a must read for you. Sleeping pills are pills that can induce sleep. These constitute substances that trigger or suppress certain brain activities which result in causing sleep. Sleeping pills are based on medical research on brain and sleep and over a span of several decades sleeping pills with the differential mode of action as well as improved mode of action have been introduced. One or more categories of sleep inducers can have a similar mode of action whereas sleep inducers of other different categories may induce sleep through different molecular pathways. Medical practitioners prescribe the suitable sleeping pill after thoroughly diagnosing the patient and problem. 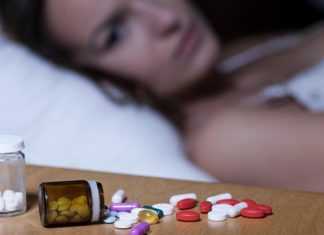 The habit of buying sleeping pills over the counter and popping them without regard has been largely criticized by the medical fraternity as several times such practices lead to substance abuse, side effects and addiction. Barbiturates, Benzodiazepines, Non-benzodiazepines (‘Z-drugs’): This sleep inducer category is based on increasing effect of GABA (γ-aminobutyric acid) by binding to the GABA receptor. In the hypothalamus, the ventrolateral preoptic nucleus (VLPO) uses GABA to induce sleep, if GABA increases sleep is induced. Drug category includes phenobarbital, chlordiazepoxide, diazepam, temazepam, zolpidem, zopiclone, eszopiclone. Antihistamines: This category of sleeping drug is actually a sleep When histamine increases in the ascending arousal system, the sleeping person wakes up, so this category of drug blocks histamine thus preventing arousal. Examples include diphenhydramine and hydroxyzine. Antidepressants: This category of sleep medicine is usually prescribed to people with depression and when sleeplessness is being caused by depression. These sleep substances act by inhibiting serotonin and histamine receptors. Examples include trazodone and nefazodone. Adrenergic agonists: The sleep inducing mechanisms of adrenergic agonists include blocking of neurons that release noradrenaline, blocking of ascending arousal system and activation of ventolateral preoptic nucleus (VLPO). An example includes dexmedetomidine. Malatonin agonists: VLPO is activated through circadian cue by the melatonin receptors. Melatonin agonists activate these melatonin receptors, thus inducing sleep. Examples include melatonin, ramelteon. Orexin receptor antagonists: Orexin neurons are responsible for signals that cause the body to wake up. The orexin receptor antagonists block these neurons and the waking up signals are inhibited thus prolonging sleep. Examples include Suvorexant, SB-649,868. (these drugs have not been approved yet). Tranquillizers are drugs that reduce anxiety. Anxiety can hamper the brains natural sleep mechanism. Anxiety is caused by abnormal increase of anxiety body substances in the brain and nervous system. When such substances are inhibited, the sleep mechanism of the brain occurs normally. Tranquillizers belong to two categories – minor tranquillizers and major tranquillizers. The former is usually referred to as antixiolytic whereas the latter is usually referred to as antipsychotic. Antixiolytic tranquillizers are prescribed by doctors in cases of anxiety, panic or anxiety with depression. These are essentially the beta blockers or the serotonine reuptake inhibitors and are generally prescribed as a ‘light therapy’. Antipsychotic tranquillizers are prescribed by doctors for conditions like schizophrenia, bipolar disorder, dementia, unipolar depression. These antipsychotic tranquillizer substances act by blocking dopamine D2 receptors, antagonizing 5-HT2A receptors and binding with the serotonin receptors-5HT2A and 5-HT2C. Some substances which occur in nature have been known to have sleep-inducing properties. Though some of these are mild and safe like chamomile and lemon balm, the others need to be used only after appropriate medical advice. Included in the category of natural sleep inducers are substances like valerian, melatonin, chamomile, tryptophan and kava. Several side effects of sleep inducers have been recorded and studied in medical history; the side effects can be minor, allergic or major. Minor side effects: include tingling or burning sensation in limbs, appetite changes, constipation, diarrhoea, balancing difficulties, dizziness, drowsiness in the day time, dryness in mouth or throat, stomach ache, weakness, headache, gas, heartburn, mental tardiness, lack of attention, abnormal dreams, the shakiness of limbs. Allergic effects: include sight problems, blurriness in vision, chest pain, breathing and swallowing difficulties, choking sensation in the throat, itching, nausea, rash, swelling in eyes, lips, throat, face or tongue, breathlessness, hives, pounding heart beat and hoarseness. Cognitive behavior therapy is a well planned behavioral therapy administered by psychotherapists. The therapists make controlled or no use of sleep inducers and rely mainly on behavioral therapy to reset normal sleep patterns in patients. Cognitive behavior therapy can be an effective therapy for anger management, anxiety, panic, behavioral problems in children and adolescents, chronic pain and fatigue, depression, drug and alcohol addiction, eating disorders, mood disorders, obsessive-compulsive disorders, relationship problems, post-traumatic stress and phobia. When is sleep medication not recommended? There may be several cases when taking sleep medication can be strictly restricted, and one such case is sleep apnea. In sleep apnea, patient suffers from shallow breathing or pauses in breathing. Sleep apnea can occur due to several reasons; the most common sighted reason is collapse or obstruction in the airway channel. Central sleep apnea a less commonly reported type of sleep apnea and occurs due to brain malfunction in controlling the breathing function of the body. When should sleep inducers be taken? Just popping sleeping pills is a hazardous habit. Common sleep problems can be addressed by changing lifestyles, taking more exercise, cultivating a positive outlook, practicing meditation and spirituality. Only certain sleep-related disorders that are related to body or brain malfunction require medical attention, and it is advisable to seek medical assistance if one has been facing sleep problems despite trying out all normal recommended measures for over a month. Sometimes there may be a disorder or malfunctioning in main body organs or the brain itself, and medical practitioners in such cases prescribe sleep medication for short duration and try to rectify the problem. Once the root problem has been sufficiently addressed and cured the sleep medication is discontinued in reducing gradient manner. In patients with chronic, severe or non-rectifiable conditions, medical practitioners may prescribe a range of sleep medication with several alterations and as well as other medications and therapy. Doctors prescribe sleep medication when effects of insomnia outweigh the effects of medication. Medical practitioners prescribe appropriate sleep inducers upon diagnosing the patient in regular intervals over sufficient period of time during which medication can be changed and ultimately withdrawn when normal sleep patterns are re-established. Medical practitioners may combine medical therapies with behavioral therapies so as to maximize gains and minimize the side effects. If you are suffering from sleep-related disorders, get in touch with PORTEA today. Download Portea’s mobile app and get all your queries concerned.